I received a new dollhouse kit from Banggood.com last Monday. I was expecting it since last week, unfortunately, our local post office didn’t return my call when I asked for the status of the EMS package on Friday. It’s early Tuesday when I started to build the kit and that I knew, it wouldn’t work for my Nendoroid or Cu-poche. The kit is too small and it will only work with my Yotsuba Figure Collection Vol.1 or Nendoroid Petites. 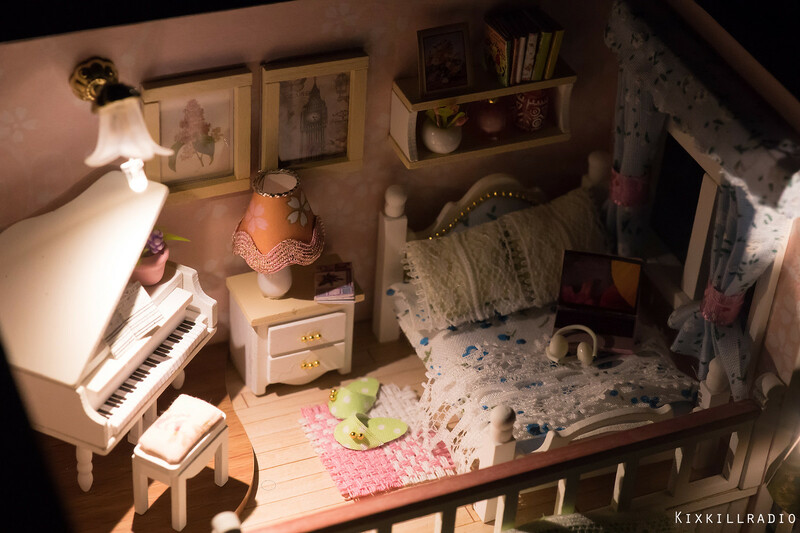 What I like about building this dollhouse kits is it gives me an idea on what to do in my future projects. I learn some new tricks on making an entirely new furniture from scratch. It gives me a slight idea about room designs and decor. Make sure to watch the video and I hope you learn some tricks too. Look at how big my hand looks at the photo below. 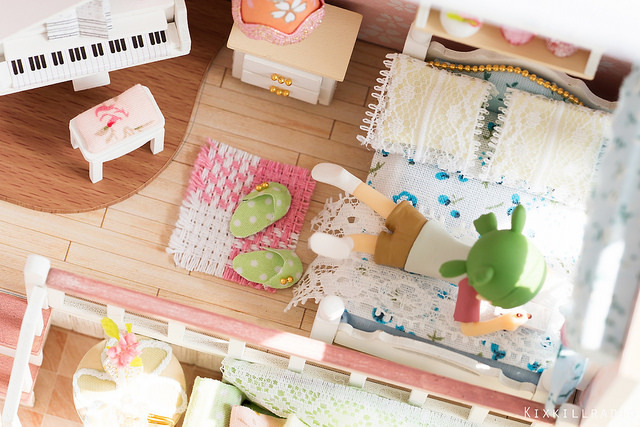 It’s really a challenge in setting all the miniatures inside the room because of the tiny space. 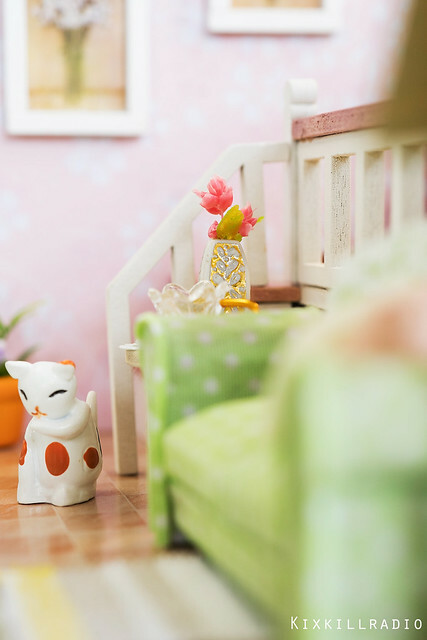 I changed a couple of things in this dollhouse kit like for instance, I used a different wallpaper. I also made one window and added a plastic sheet to make it look a bit more realistic. Instead of using paper for a rug, I used a small piece of cloth that I found at home. 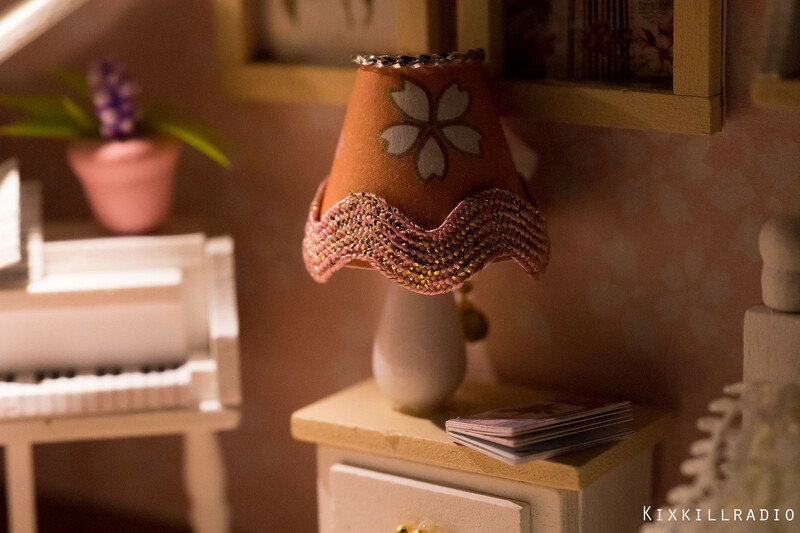 I also used different materials for the lamp shade and floor lamp. 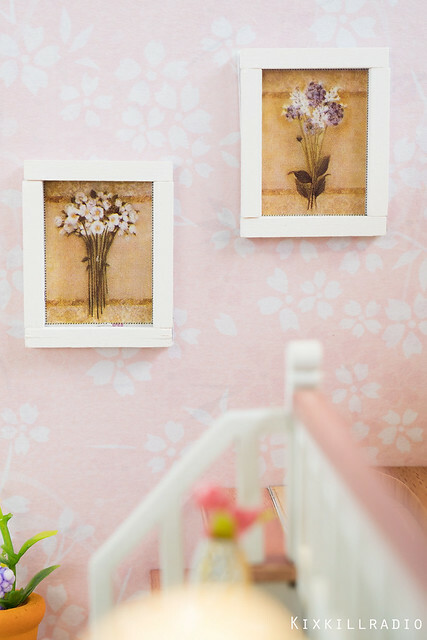 The pictures on the wall frames are provided by the kit and I also added a plastic sheet to make it more “real”. The sofa looks really cute but the truth is I made quite a few mistakes while making it. I guess you’ll just have to adjust the camera angle in hiding the imperfections. I love how the artificial flowers and the vase look pretty and elegant. 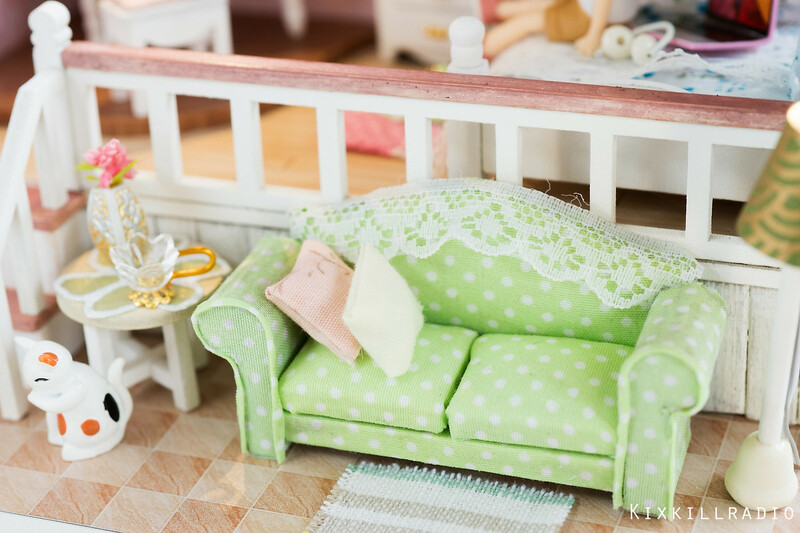 It matches the girly look of this dollhouse. While making the piano, I realized that I can make another one using PVC boards and this time it should be scaled to my Nendoroids & Cu-poche. 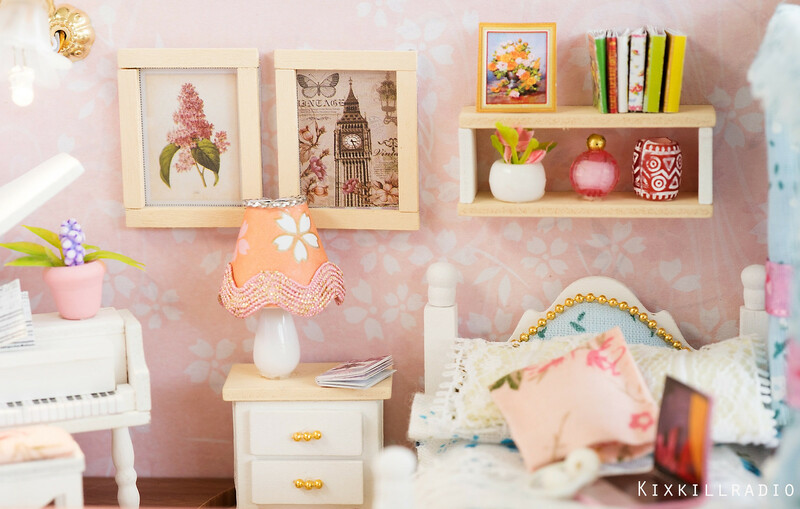 I love the room design of this dollhouse kit plus the bright and feminine theme too. 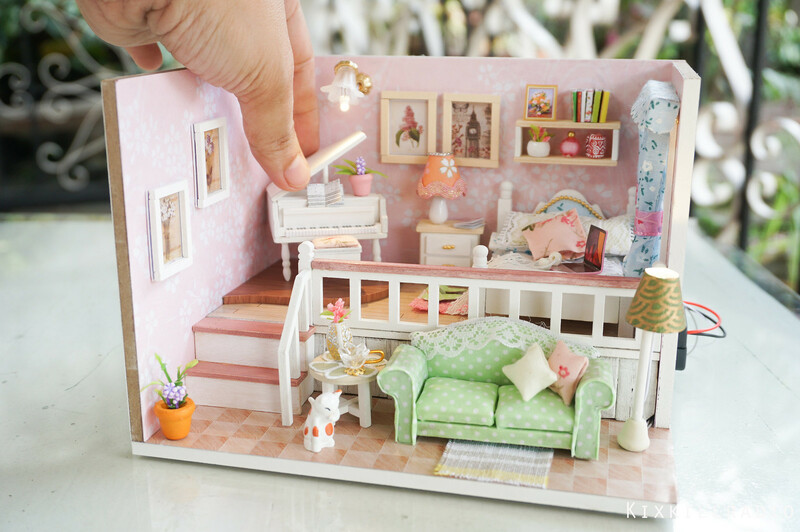 The dollhouse kit comes with LED lights. 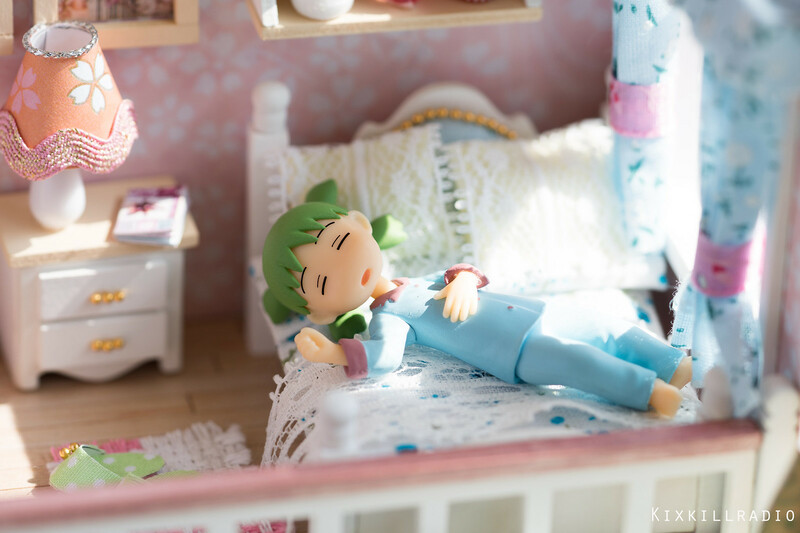 Such a warm and cozy room for my Yotsuba. 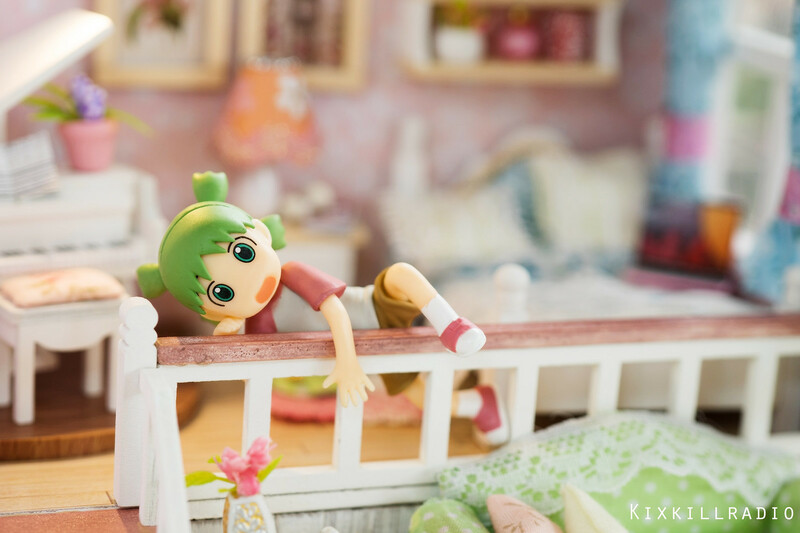 Good morning Yotsuba! Wake up now! 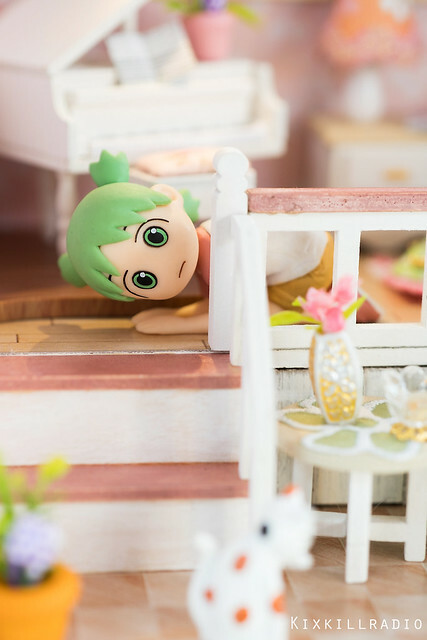 And the energetic Yotsuba tries to come down without using the stairs. 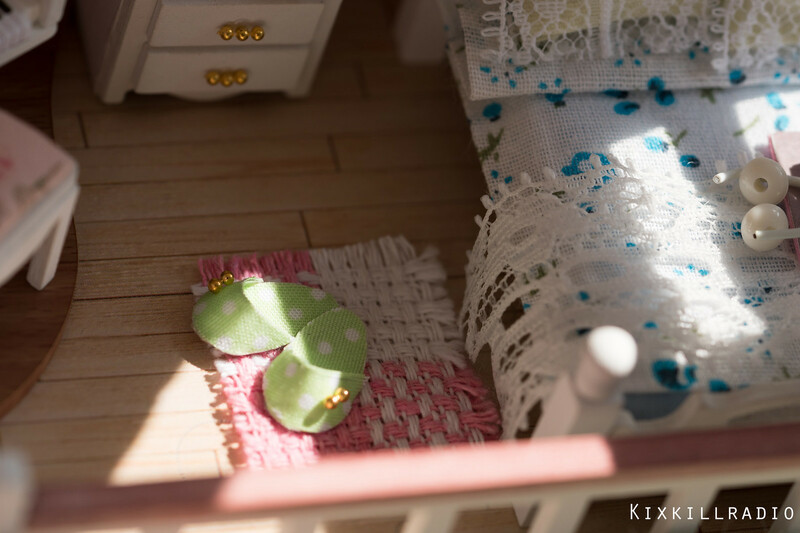 I still have many Yotsuba pictures in this dollhouse, but you will see them in my upcoming Photobook Vol. 3 soon! 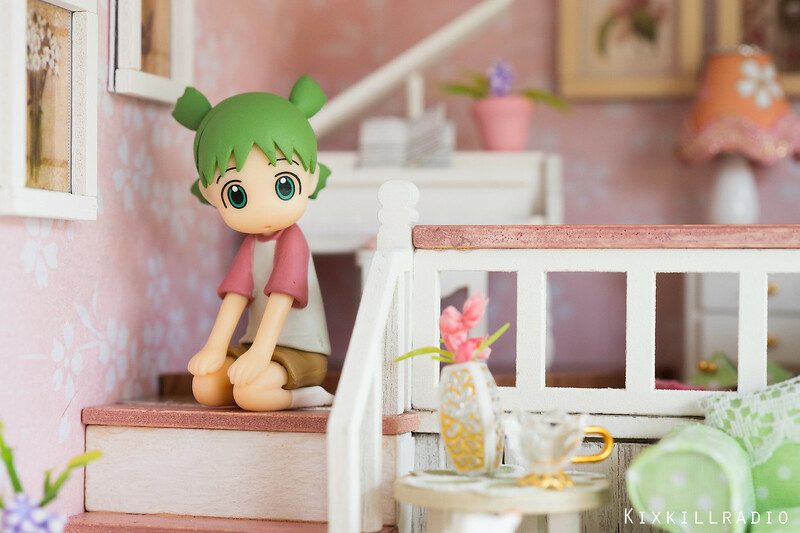 I hope you enjoy this post of Yotsuba in her new home. Have a great week everyone! *kyahh! 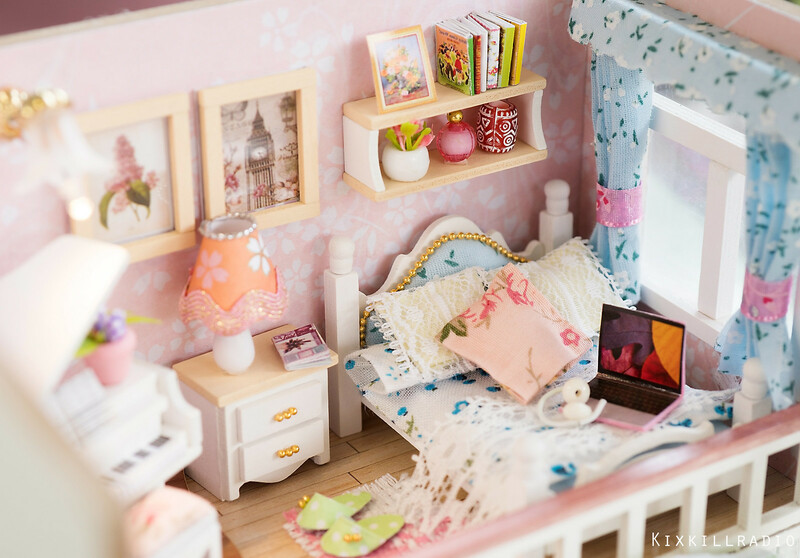 * this is such an adorable miniature house/room set ❤️ . 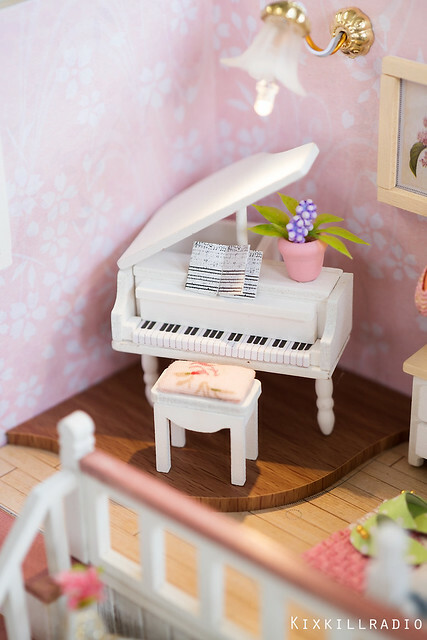 the piano eats some space, I would probably push it in the garden lol but I like all the parts and the design of the house with it’s light and comfortable colors is pleasing to the eyes. 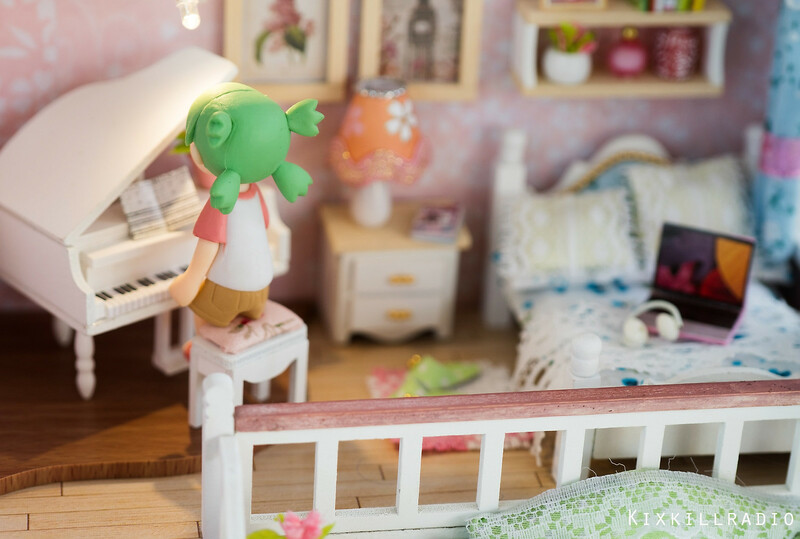 Good that Yotsuba has her own house now ;D It’s really cool that the different figures of her can interact with the interior, the pictures are lovely.